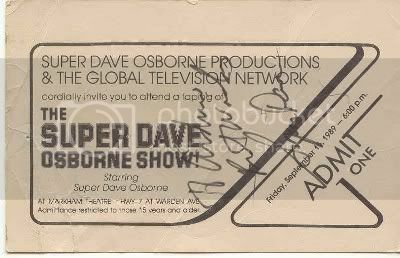 When I was in high school I got to see the filming of a bunch of studio segments of the Super Dave Osborne Show. I was also fortunate enough to see live performances by Colin James, En Vogue, the legendary (and I mean absolutely legendary) Ray Charles, and that calypso band that knows "plenty songs" but only plays Copacabana. 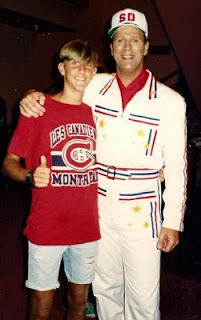 One night, when only a hundred or so people stuck it out to watch filming for the season wrap, I was picked to go up on stage and spend a second talking with Super Dave before muttering the 5 words I thought were sure to make me famous: Take it away Mike Walden! The good news is that 6 or 7 years later I was at The Bombshelter (an on-campus pub) and some guy rand up to me and said that he had just seen me on Super Dave the night before. For the rest of the night he and his buddies bought me drinks and treated me like a king. I failed my exam the next day, but it was completely worth it. To this day I have not seen the clip and would very much like it if I could get a copy. If anyone out there has old Super Dave episodes on tape, I'll gladly pay to have the one I'm in copied and mailed to me. That's awesome, can't believe that I hadn't heard that story before today! I'll search around, but I'm guessing you've already done that. Admittedly I have not done a full scour of the Internets in search of The Lost Clip. 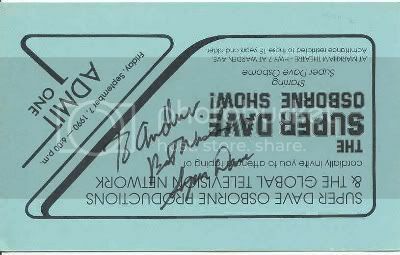 I am starting to ramp up though and am determined to find this little nugget of Canadian history. It's my personal penicillin and standard time, all wrapped up into one. There may be even a Heritage Moment in the future. You get my vote for a Walk Of Fame star! Been a SD fan since Bizarre & since they mentioned Saskatchewan on it (though all our Seal Skin Bindings are imported). Thanks Big K. Did you check the next post? Someone found the clip!